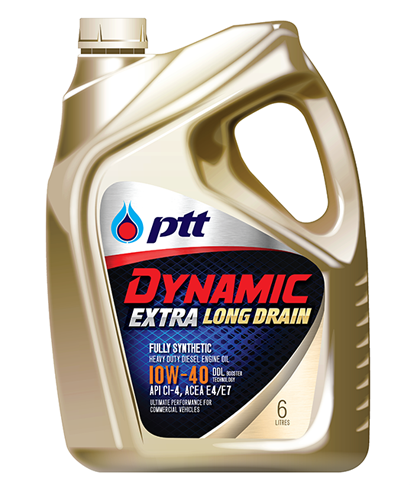 [DYNAMIC EXTRA LONG DRAIN] น้ำมันเครื่องสังเคราะห์ 100% ผสมผสานเทคโนโลยี DDL Booster เหมาะสำหรับเครื่องยนต์ดีเซลงานหนักสมรรถนะสูงรุ่นใหม่ รองรับมาตรฐานมลพิษไอเสียสูงสุดถึง Euro VI เช่น รถบรรทุก, รถลาก, รถทัวร์ และเครื่องจักรกลหนัก Premium fully synthetic heavy-duty diesel engine oil with DDL Booster technology. Formulated for ultimate performance of modern diesel engines up to standard emission EURO VI both on-highway and off-highway applications such as trucks, buses, trailers and heavy. • Designed for modern heavy-duty diesel engines standard emission up to EURO VI with all compatible after-treatment device such as DPF, SCR of commercial vehicles such as trucks, buses, trailers and heavy equipment. • Recommended for all models of diesel engine commercial vehicles such as trucks, buses, trailers heavy equipment and pickup trucks. • Suitable for diesel dual fuel gas engines. • Can be used for gas engine of commercial vehicles running with NGV/CNG/LNG or LPG. • Reduce oil consumption resulted from the lower evaporation rate.